If you have back issues of this amazing resource please let us know and we will scan them for you at no charge and then post a copy of the PDF here for others to download and review. Hello...People call me CAPTAIN HOWDY I can be found cruising the strip in my 72 AMX Javelin, "highly modified I might add", in Fort Lauderdale, Florida. I am a graduate student from the local Art Institute. I am already degreed in: Electronic Engineering and Computer Engineering. I have several degrees in other fields of interest to my future. I am now working in web Design. This is a test page and will not have much information on it until much later. I do run a PRIVATE web server from my house and do a some trading in Software as well as having a huge collection of MP3 files Just look for captain Howdy on your messaging network and this could give you access to over 10,000 tracks I share. ;) . Below are a few of the places I frequent on the WEB. Find some interesting sights on the WEB below. 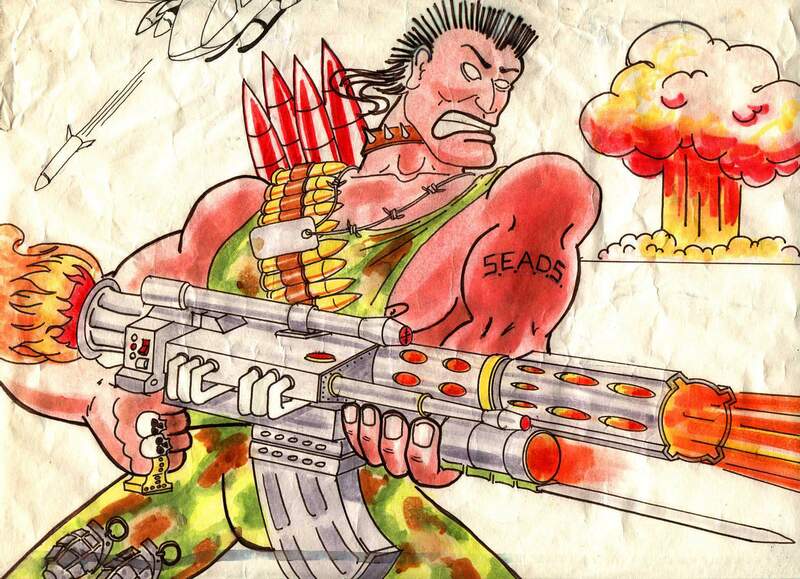 Robert L. Jones is the editor of our news letter printed for S.E.A.D.S. Our organization communicates with like minded people with the ideal of "If the U.S. ever fell, what could be done" We are organizing a group in the South Eastern part of the country. We are not fanatics or crazies. We at S.E.A.D.S. just worry about how to take care of our selves and our families if certain things happened to this great country of ours. If you feel you would be interested in more information on this, contact us with E-mail and we may talk. Fallout Simulator - An excellent shareware program that allows you to enter a nuke yield in kilotons and a wind speed. The program will then compute the distance from ground zero that the fallout will spread at given intervals and the strength of the radiation dose. With yields above 50kt, a map of the world appears and you can pick a target to simulate an attack. Use this to plan your Disaster Response Operations or Evacuation routes. Size - 60kB, in zip format, works with DOS or Windows. How stuff works "How Fallout Shelters Work"
How stuff works "The Dangers of Radiation Fallout"
How stuff works "Fallout Shelter Basics"
How stuff works "Fallout Shelters: Lots More Information"
S.E.A.D.S. Web Page Hosting www.seads.com This is a private Web Server that will have information available to certain members of our organization. This is our corporate Web Presence and has a lot of information available for trade as well as services we can offer to users in the South Florida area. Unfortunately at present we must bring in some cash flow to help sponsor or hopes and dreams. The web hosing service is a source of cash flow. No copy righted materials available but lots of other files of interest. We can offer hosting free of charge to like minded individuals. We also use to run a BBS system but at present that project is on hold until further notice. You can contact our organization via the world wide web. or E-Mail us at the following address. By accessing our resources at the web address we will be hosting message boards to help one and all learn much more information about self sufficiency and readiness preparation. We are considering offering many fun and possibly useful online games in the near future. See you latter if you have a news reader attempt to point it to news://news.seads.com/survival to access those resources once they are operational. At present you can subscribe to a Quarterly News letter free of charge via email by contacting our director of publishing at the below addresses. Just request the survival news letter.